Congratulations! Dr. Andrea Petruka is the winner of the Pets + Us Champion Award! We want to thank all the amazing clients who voted for Dr. Petruka. The competition was narrowed down to five contestants with the highest number of votes. Dr. Petruka was chosen as the winner after the Pets + Us judges evaluated each of the five finalists. As Champion, she was given $1,500 to donate to a charity of her choice. Dr. Petruka is very passionate about the St. John Ambulance Therapy Dog program in Saskatoon. Therapy dogs (and cats!) bring joy and comfort to people in need of a friendly visit. 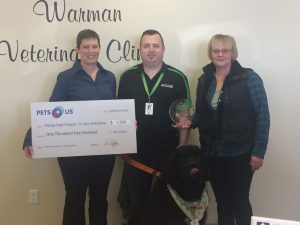 The program started in June 1992 as a pilot program in Peterborough, Ontario and today nearly 3,000 Therapy Dog teams reach thousands annually all across Canada. The Program varies across Canada based on community needs and the availability of volunteers. Therapy Dogs routinely offer comfort and companionship in senior residences and care facilities. In hospitals, they may be providing relief and distraction for patients awaiting cancer treatments. There are special programs such as “Paws 4 Stories”, which help young children learn to read and in some communities Therapy Dogs work with youth at risk and children with special needs. University campus visits are very popular, helping to relieve stress during exam periods. In special cases, Therapy Dogs can be found working with social workers and psychologists during times of crisis as well as in rehabilitation centers to support recovering addicts. The Therapy Dog Program is continuing to expand as communities recognize the special contributions that St. John Ambulance’s caring, four-legged volunteers can bring to Canadians of all ages in all life circumstances. To learn more about this exciting and rewarding program, please contact your nearest St. John Ambulance location.